Welcome to the 2017 West Regional Conference for the National Association of Graduate-Professional Students (NAGPS)! 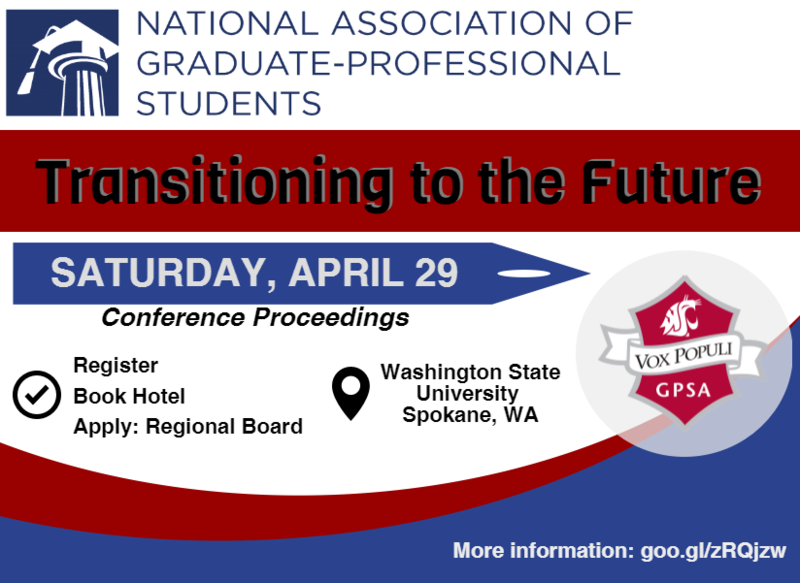 This event is scheduled for April 28-30, 2017 at Washington State University in Spokane, WA, and is hosted by the Graduate Professional Student Association(GPSA) at WSU. This year in particular, the conference theme is Transitioning to the Future. The event will bring together graduate student leaders from across the Western US. The conference will focus on important aspects of leadership, advocacy and transition in graduate student government. More information Coming Soon! In the meantime contact wrc@nagps.org with questions on the event. We have a room block at the Fairfield Inn & Suites Spokane Downtown for $99/night – use the code NAGPS and book by April 1st for the reduced rate. If you are flying into Spokane, you will arrive at the Spokane International Aiport, which is located ~15 minutes from WSU Spokane. You may take a rental car, taxi, or Uber ride from the airport to your hotel. Please Review all the Tabs for detailed information about registration and contributing to the conference. During the business meeting of the conference, elections for regional board will take place. For each position, each candidate will get the chance to give a 3 minute “campaign speech” followed by question and answer session by the membership. Afterwards, a closed discussion and closed vote will determine who is elected. (NOTE: Regional Chair positions are elected at the National Conference). 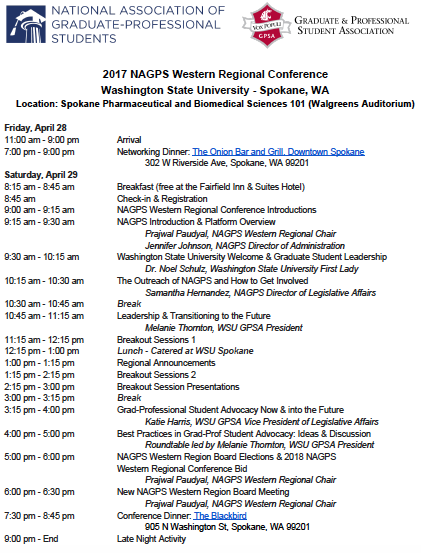 If you are interested in hosting the 2018 Western Regional Conference, you must submit a letter of intent to the NAGPS Executive Committee (excomm@nagps.org) AND Regional Chair (wrc@nagps.org) before the regional conference, April 1, 2017. This letter shall provide two important elements: (1) approval of the graduate-professional student organization (GPSO) to host the regional conference; this can include approval from your GPSO, Dean, or Administrator, and (2) a named Director of Regional Conference to coordinate planning and volunteers of the regional conference (the Director must be a member of the host organization). Time will be allotted for questions on each proposal. After all regional bid presentations have concluded, there may be a closed discussion followed by a vote of the membership. The majority vote of the regional membership will elect the host institution for the 2018 Regional Conference. Host institutions shall secure funding for the conference. It is the responsibility of the host school to lead fundraising efforts. All fundraising and other partners must be submitted to the Board of Directors, which reserves the right to reject any partnership. Host institutions shall adhere to the NAGPS Constitution, Bylaws, and Standard Operating Procedures. All approved written and verbal communications to host the conference are binding. For more information or questions, please contact the Vice President, Joseph Verrado at vp@nagps.org. To promote NAGPS values and regional collaboration, we enthusiastically encourage all attending institutions to deliver at least one platform presentation. Please submit your abstract(s) to the 2017 NAGPS Southeast Regional Conference website under the “Submissions” tab at the bottom of the page (click here). Topics of particular interest include access/affordability of graduate education, graduate school funding, effective and visionary leadership training, employment concerns, social justice advocacy, national and international student needs, work-life-balance, and the importance of collaborative capital activism, volunteerism, and service. The deadline for submission is Friday, March 17, 2017. More details are forth coming, so please check back soon!